When Kunwar Vijay Pratap Singh took over as DIG of Amritsar Central Jail last year, the prison was in horrible shape. Built to accommodate a thousand prisoners, it housed more than double. Jail staff, notoriously unkind to inmates, was divided into warring factions. Prisoners had to grease palms for everything. In short, Amritsar jail was like any other Indian prison. Conjure an image of a dank, cramped cell with dirty bathrooms, rotten food and jail officials ready to roast you. But in the span of one year, Kunwar Vijay Pratap Singh turned Amritsar jail into a model that is being replicated across Punjab. "I dedicate my work to the holy soil of Amritsar," he said as he walked away with an award given by the India Vision Foundation in recognition of his work. The foundation is headed by Kiran Bedi, India's first woman police officer, well known for her zealous efforts to reform Tihar jail, Asia's largest prison, which won her the Magsaysay award. She started the foundation to continue her work. While most Indian jails carry on as medieval dungeons, a small movement for reform is underway inspired by Kiran Bedi's efforts. "It showed us that relations between jailors and prisoners can be changed," remarked one jail official. The award function, held on 31 August, also honoured SP Singh, the vice-chancellor of Guru Nanak Dev University, (GNDU) for extending educational facilities to inmates of Amritsar jail. Sunil Kumar Gupta, a law officer from Delhi Central Jail, was honoured for his efforts to get undertrials released while a team of jail officials from Haridwar were awarded for introducing organic farming in their prison. 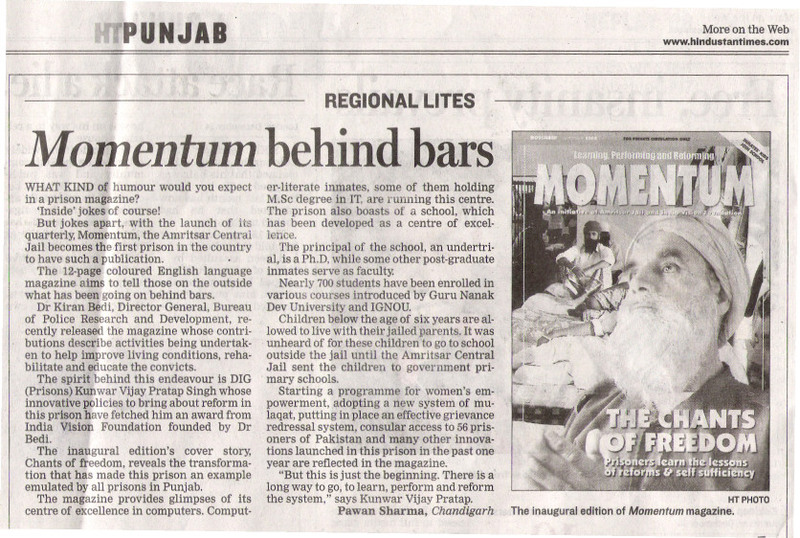 The turnaround at Amritsar jail is dramatic because Vijay Pratap's reforms sought to change the character of the prison. Jails don't need to be congested. Across India thousands of prisoners are under trial. Most jail officials agree that almost 80 per cent are arrested for offences that are bailable but many prisoners are too poor to pay. "I wanted to save ordinary prisoners from becoming criminals," says Vijay Pratap. He helped to get 350 undertrials released. He got a Legal Aid Cell started with help from the India Vision Foundation, Lawyers for Social Action and local advocates. Free legal help is given to Bangladeshi and Pakistani prisoners as well. 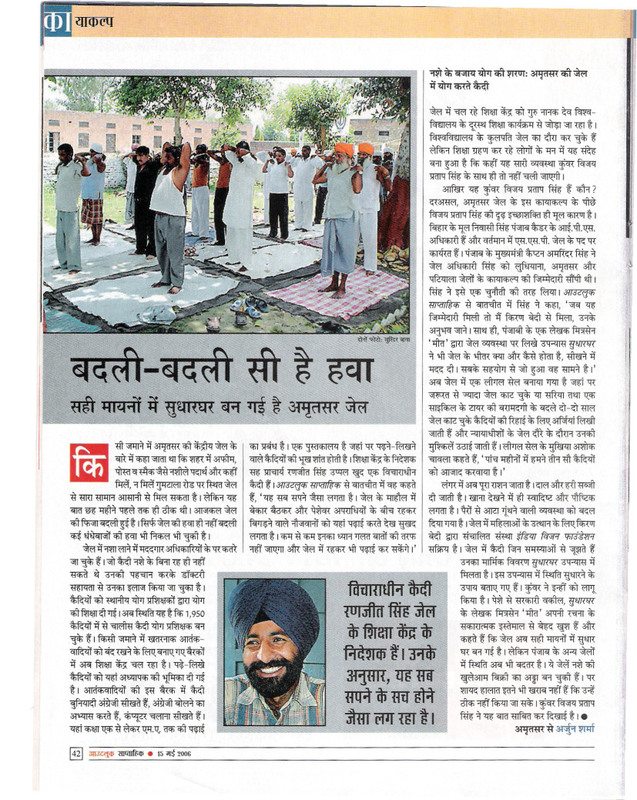 He also got the cooperation of the District and Sessions Judge, Amritsar. those against whom the police had not filed any charge sheet within the stipulated period. The departure of 350 prisoners created more room. Instead of sleeping on the cold hard floor, for the first time, cots are being provided to prisoners. These are made in the jail premises and have been given to women inmates. Efforts are on to improve infrastructure. Committees of prisoners make sure food is of good quality, is distributed fairly and cooked hygienically. Corruption has been weeded out. The jail also provides inmates an alternative career so that they can contribute to society and don't need to turn to crime. The jail's education centre was started in May this year and inaugurated by Kiran Bedi. The Guru Nanak Dev University offers certificate courses in computer basics, TV maintenance and tailoring. The university has financed a computer lab. SP Singh, vice-chancellor of GNDU, visited the prison and took a decision to link the university to it. "He has shown what a university can do," says Kiran Bedi. Prisoners run the education centre. The Principal is an undertrial with a Ph.D. 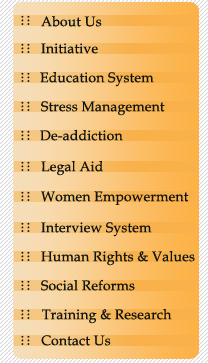 There are five faculties: higher education, adult education, school education, languages and computer education. Educated inmates run the courses. Inmates can study for graduate and post-graduate courses. IGNOU has also set up a centre in the prison and a library has been started. Seven hundred students have enrolled. None of the children were going to school when Vijay Pratap took over. A government school was identified and the children are sent there. Some jail officials objected, saying it's not in our rule- books. Vijay Pratap asked them where is it written that children should not be sent? There is also a crèche for the children. Women are taught candle-making, tie and dye etc. To improve the mind and relieve mental stress there is yoga and meditation every morning and sports in the evening. Some 40 prisoners have become yoga teachers. Also, a de-addiction centre has been started. Drug abuse was rampant among inmates. All those involved in selling and distributing drugs, including jail officials, medical staff and prisoners were rounded up. They were transferred and FIRs lodged against some. The de-addiction centre is being run with help from the Civil Defence and Rotary Club in Amritsar. The prisoners have a say. There are complaints and suggestion boxes near the Gurdwara and temple inside the jail. The boxes are opened either by Vijay Pratap or his assistant. Prisoners can meet the DIG during office hours. The prisoners were very moved when the Brahma Kumaris visited the jail and prayed for their long life and happiness.